We partner with ambitious brands, to create a memorable spatial experience and aid orientation through an environment. LinkedIn pulls every stop to make their employees happy and productive at work. We took the same ethos and spatially designed it into the brand experience. 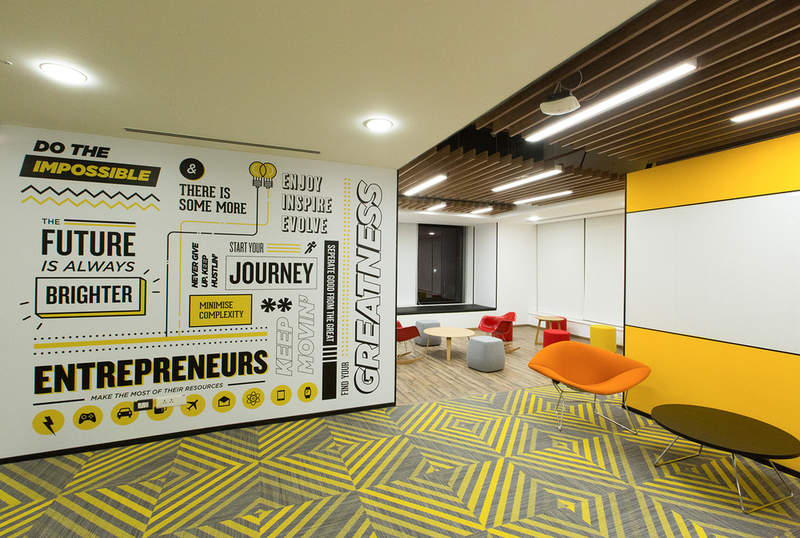 The office celebrates LinkedIn's cultures & values whilst bringing about the local Indian culture in a modern experience. The 2,20,000 sqft office space is split between two floors and is strongly connected by their culture and values permeating through the office. Each floor plate is divided into quadrants, resulting in each quadrant to have its own design theme in coherence with a value/culture of LinkedIn. These aspects also help employees & visitors with an easy way finding experience. The concepts for each quadrant ranged from an University, Library, Glasshouse all the way to a Street out of India. These themes were tastefully designed to subtly work in harmony with the space, and at the same time give an opportunity to learn at every turn of the office. All the installations and graphics are not just ethically pleasing but are highly functional too! To take advantage of India's cricket frenzy culture we also built a 7 by 7 foot free standing In-Bug made out of customised leather cricket balls. This lead to a great photo opportunity for employees as well visitors coming into the office to share and show off to their friends! The result was a space where people could relax as easily as they could work! The reception area and its quadrant was designated as the Member's facing area. These had key features of the brand, that had been rendered and built to bring out a more regional feel, yet keeping it modern. This area was designed like a university/school from India to reflect the value of Relationships Matter. This area was designed like a Glasshouse to reflect the value of Open, Honest & Constructive. This value reflected through the space spatially with the interior finishes, that act as a graphics and way finding aid. To reflect the value of Demand Excellence we designed this space to be like an Art Gallery/Museum. This resulted in an interactive space for the employees to showcase their artwork or photography. This also allows LinkedIn to possibly even have a small art show to visitors. The value of Collaboration made us designed this quadrant as a library with some really interesting installations. The collaborative space resulted a wall having 25,000 pencils! and the opposite wall filled with custom post it pads that formed its own yellow pixelated art as it is being used. 'Take Intelligent Risks' led us to look at this quadrant to be designed like a startup. As the value connected best to this design theme, since we make the most out of the least that we have! 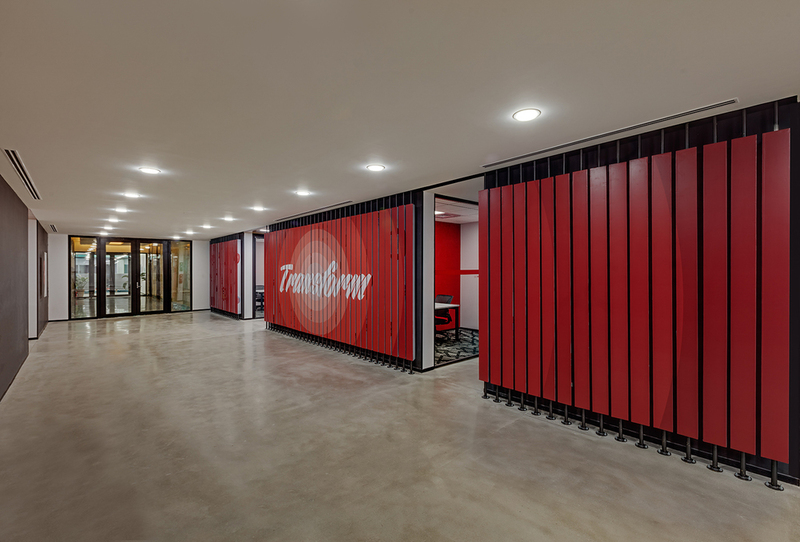 The space has the corridors designed with inspirational messaging rendered in a typographic form. and Also a collaboration area designed like a crossword that had words hidden in them. The way finding were divided into three verticals. Informational, Directional and Nomenclature. Informational signs were placed in collaborative zones, games areas, services etc. The directional signs helped people through the space in the corridors. This was also aided by a customised floor map to go along with the rest of design in the space. We also named the meeting rooms and designed the wayfindg on the glasses to meet LinkedIn's international guidelines in their office space. Taking cue from the Iconic yellow Indian phone booths,we have designed and reinterpreted it as a modern version of them. The graphics and colour scheme reflect the characteristics but add and cohere with the rest of the space design. The aesthetics allow a user to find it easily in the space, due to the pop of colour. These areas have some unique features that bring about Indian characteristics with fun installations. A 7 by 7 for In bug made out of customised cricket bats, and cricket bats that are engraved to add a brand message to the space. The central area of the floor plate leads it to the cafeteria and the all hands area. The space was designed to reflect a community and branded as the verandah. We also commissioned artists to hand paint two 30 foot walls in the space, that reflect characteristics of Bangalore. One wall reads the old Bangalore and the opposite the new and modern Bangalore.